Online registration is available for our upcoming annual conference on May 9, Creating Communities. The conference registration fee is $50 for NLLA members and $75 for non-members. Not an NLLA member or need to renew your membership? You can join or renew online. The registration deadline is May 5. This year’s conference will be held at the A.C. Hunter Public Library in their new Community Room (located at the back of the Children’s Library on the ground floor). 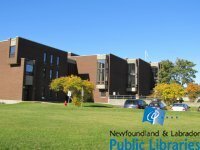 The A.C. Hunter Public Library is located in the St. John’s Arts and Culture Centre located at the corner of Allandale Road and the Prince Phillip Parkway. The program is available on the Conference page. Our keynote speaker is St. John’s poet and Librarian, Anna Swanson. Her debut book of poetry The Nights Also (2010) won a Lambda Literary Award and the Gerald Lampert Award for best first book of poetry.